We're excited to host you! Your quest to find a tent only Moab Campground stop. Base all of your adventures and exploring in Arches & Canyonlands National Parks from Moab's best, Up the Creek Campground. Just two blocks from Main Street, Up The Creek is a cozy, urban campground - an oasis of peace and relaxation in the heart of of Moab. Our 18 site, tent-only, park & walk to your site campground is nestled within a grove of large shade trees next to a cooling perennial stream. We are located off the beaten path, yet a just a short walk to Moab's many restaurants and shops. Our close proximity to Arches and Canyonlands National Parks as well as the World Famous Slick Rock Bike Trail gives you easy access to any adventure you choose! Don’t have your own tent or sleeping bag? 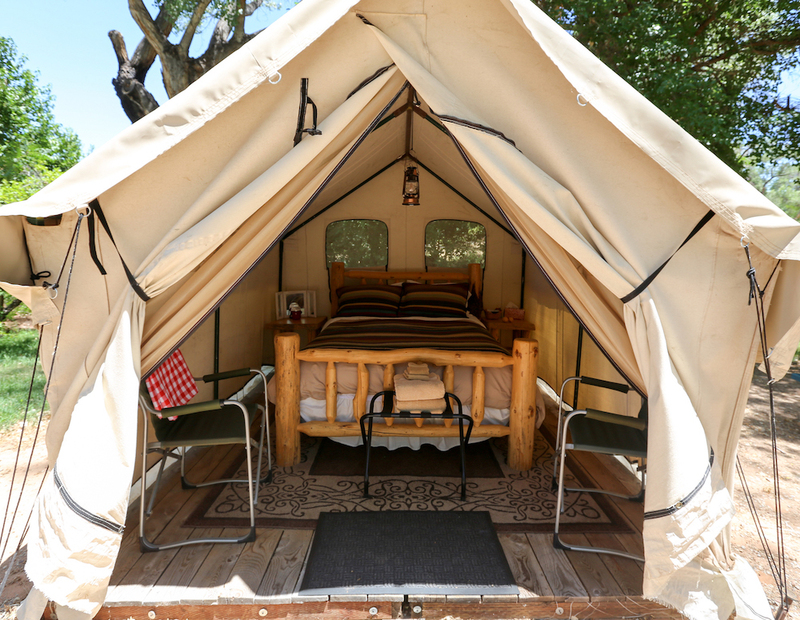 Stay in one of our Luxury canvas tents. Luxury tents are large, fully furnished canvas tents. *We have tents with either 2 twin beds, or 1 queen bed. You may add up to 2 additional people to your Luxury Campsite by either having them sleep in your tent on the floor, or by pitching a tent next to your Luxury Tent. Pricing or Questions about this addition? Contact Us! Prices do not include 14.67% tax. Have a larger group? We are happy to accommodate, just read our group policy and let us know when you book in the special notes section! Walk in tent camping. There are no noisy RVs or cars in the campground. It is only 100 feet from the parking area to the first campsite. Clean bathhouse. Hot showers, flush toilets. Outside sink for washing dishes. Creek side camping on level sand, dirt, and rock beds with well kept grassy grounds makes this campground a perfect place to relax after a day of Moab fun. Grilling stations available on the property. Forgot your tent? We offer fully furnished luxury tents available with a Queen Bed or 2 Twin Beds. From Moab's Main St./Hwy 191, turn east on 300 South. Up the Creek Campground will be on your right, after about two blocks. Look for our sign at the entrance to the parking lot. Are the bathrooms always open? The bathrooms are closed from 11am to 1pm for cleaning. Please plan accordingly. Can I stay up late, talking with my friends? Quiet hours are from 10pm to 6am. Sound travels quite easily throughout the campground. Please respect your fellow campers. Can I set my tent up or sleep on the grass? Each campsite has some grass next to it, but where you place your tent is dirt. Sleeping on the grass is not allowed. The grass gets watered. Make sure to move your personal belongings off the grass when you are not around. The campground is next to a perennial stream and there are large cottonwood and other trees throughout. The shade moves around with the sun, so your site might not be shaded all day, but overall the campground and campsites are shady. Please note, during early Spring there will be minimal foliage in camp and if we are experiencing a regional drought the stream will be less full. Can I sleep in my car? All the campsites at Up The Creek are tent only, park and walk to your site. There are no vehicles allowed in the campground or sleeping allowed in cars. Cars are parked in a parking lot. People walk to where the campsites are. How far of a walk is it from where I park to where the campsites are? Some campsites are a less than 1 minute walk and some campsites are a less than a 2 minute walk from where the cars are parked. The campground provides carts to help you with shuttling your supplies from where you park to where your campsite is. Is there a place I can lock my bicycle? There are different options for bicycle storage. There is a bike rack near the bathhouse where bikes can be locked up. Some people leave their bikes locked on the bike racks of their cars. Most people keep bikes at their campsites where they can easily be locked to the picnic table provided at each campsite. What is provided with the Luxury Tent? Luxury tents are large, fully furnished canvas tents. Furnishings include; cozy beds with linens and comforter, side table, chair, battery lantern and towels. Maid service is not provided. (Linens and towels are not changed during stay, but additional linens can be provided upon request for an additional fee.) Tents are not heated or air-conditioned. We do not have an office onsite. however we are in camp 3+ times a day in the morning, afternoon and evening. If you need assistance or are having a problem please call and leave a message (we will call you right back), email us, or put a not in the post (we check it 3x/day). The house located next to the campground is a Private Residence, please do not disturb. We have a small private parking lot for reserved guests of the campground, it can accommodate large and small vehicles. If you will be needing to park a trailer, please contact us as you may need to use the street parking in front of the campground. Is there a place I can charge my electronics? The campground's bathhouse has outlets where you can charge your electronics. There is no WiFi at the campground. It is just a short walk to places where you can get online: laundry mats, the library, coffee shops, etc. Where is the closest place to do laundry? The closest laundry is three blocks from the campground, open 7 days a week, 24 hours a day, and provides free WiFi. Moab, Utah, home to Arches and Canyonlands National Parks, is surrounded by some of the most stunning red rock landscapes on Earth. Moab’s unique combination of small resort town hospitality, beautiful scenery and the cool waters of the Colorado River has made it one of the most sought after destinations in the American Southwest.